﻿ Exponential Technology: Everything is closer than it appears. 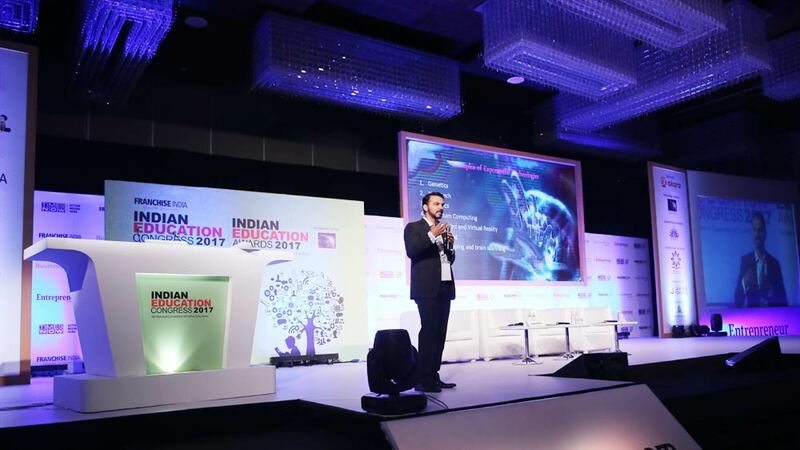 Indian Education Congress 2017 conducted a session where the Innovative Leader of GEMS Education, Mr. Robin Roberts talks about embracing Technology in today’s time. India Education Congress 2017 conducted a session where the Innovative Leader of GEMS Education, Mr. Robin Roberts talks about embracing Technology in today’s time. The session was commenced by Robin Roberts, briefing about his organization. Moving ahead with the session, he asks the audience to pause for a moment and think about the extraordinary world we live in and the astonishing and logical level in which the world operates. He plays a 3 minute video of his friend Jason Silva, ‘The future of US.’ Sharing his views on this piece he said, “It sets the tone of how I feel when I think about the future. The reason I watch his videos is because he sees the positive side of Technology, said Mr. Robin. This session focuses on many factors. Starting with ‘Introduction to Exponential Technology and the overview of what it means to have in abundance of mindset and further stressing on the disruptive innovation’s impact on Education. He starts with highlighting the difference in Exponential growth and Linear growth. Linear growth functions change at a constant rate per unit interval. An exponential growth function changes by a common ratio over equal intervals, said the Innovative Leader. App-centric schools will be more common than platform-centric schools but will be marked (for good and bad) by more idiosyncratic learning. Supporting blended, personalized, and competency-based learning is a team sport. Mr. Robin believes ,”As someone who has interviewed individuals behind some of today’s most mind-boggling inventions and disruptive companies and showcased their cutting-edge ideas to the world, I’ve come to believe that exponential advancement is what India needs the most.” In recent years, it has become clear that we need platforms to learn about and encourage the development of exponential technologies, especially to address today’s grand challenges. Like many of us, said Mr. Roberts,” I feel both scared and excited by exponential technologies. I worry about the repercussions on families, friendships, careers, and what it takes to remain relevant in this fast-paced world. But the excitement wins out. What strikes me most is that India has a great opportunity to lead in innovating in these new areas.. Similarly, technologies of today and tomorrow can enable India to leapfrog old systems and become leaders in our own right, added Mr. Roberts.